The Pittsburgh Poison Center responds to over 150,000 requests for poison information each year. It is staffed 24/7 by nurse specialists with extensive training in clinical toxicology. 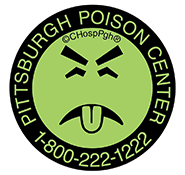 The Pittsburgh Poison Center created Mr. Yuk in 1971 to education children and adults about poison prevention and awareness.